Organic reach dwindling has many business owners using Facebook frustrated. While there are ways to combat a lower organic reach, Facebook Ads are a great option for many business owners looking to boost their reach or target consumers. Once you realize that Facebook Ads are one of the best and easiest ways to target your consumer (at a level that many would consider creepy), paying for ads becomes an obvious marketing solution for many businesses. Even when hiring an agency to build and manage ads for you, Facebook ads are one of the least expensive options facing marketing budgets today. The unfortunate thing about Facebook ads right now is that they seem to be a bit too easy to set up. If you don’t do your homework, you could end up wasting paying money on ads that aren’t hitting your desired market. If you’re setting up your ads by clicking the “Boost Post” button, this blog is for you! The biggest issue that we see with businesses having trouble with Facebook ads is that they’re not sure what they want to achieve with their ads. 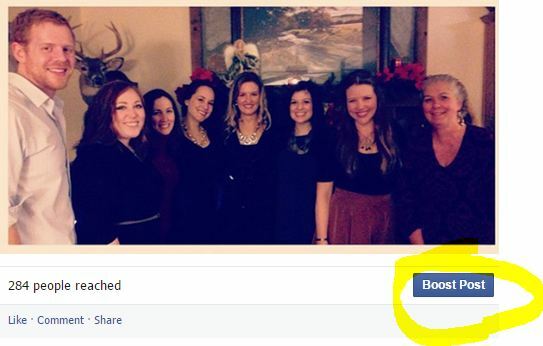 Are you looking for likes, comments, or do you want customers to book more events? Before you decide to create an ad, make sure you know what you want to achieve so that you can properly track the results and understand the return on investment. 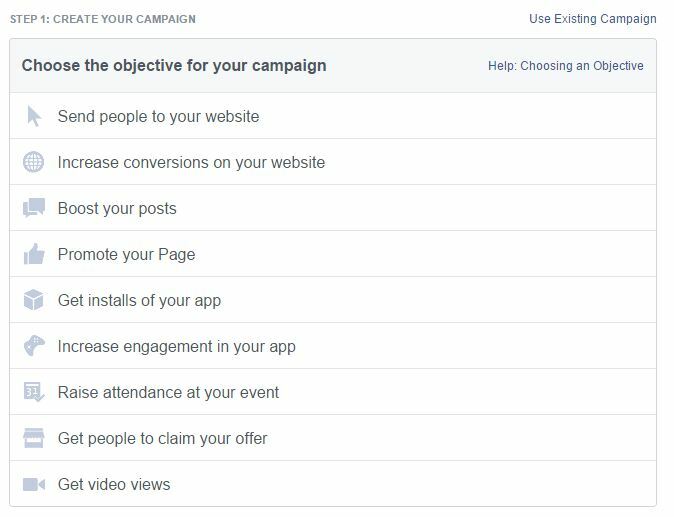 Did you know that there are 9 different ways to create ads depending on your objectives in Facebook? That’s right! “Boost Post” is not your only option! You have the option to send people to your website, Like your page, engage with your post, advertise a special offer, and much more! Do you want more kids to attend your all night skate event? Advertising an event might be a better option for you than to boost a post. What excites me about Facebook as a marketer is the same thing that creeps me out as an individual. The juggernaut social network knows us really well! You can target Facebook users who live in Phoenix, are moms of children between the ages of 2 and 10, living in a home worth $350k, and like Women’s Health magazine. If you have some coding knowledge or actively build your email marketing lists, then you can retarget Facebook users in an entirely more efficient way so that you can continue their experience with your brand for days or weeks! Once you find the right image, make sure that you’re using the right text and call to action. The great thing about Facebook ads is that you can easily test a variety of ads targeting the same group. Try something simple and short against an ad with a larger amount of text. Unlike other paid advertising options online, Facebook is still extremely inexpensive. This is especially true when you consider how deep you can dive into the personal data and retargeting options that Facebook provides to advertisers. When you begin to build your first Facebook ads, be ready to spend a few Starbucks lattes on experiments to find your groove. When you understand who you are targeting and how you can target them, Facebook ads become one of the least expensive ways to reach your market. Before you print out hundreds or thousands of flyers that won’t be passed out, consider putting that budget towards Facebook advertising. 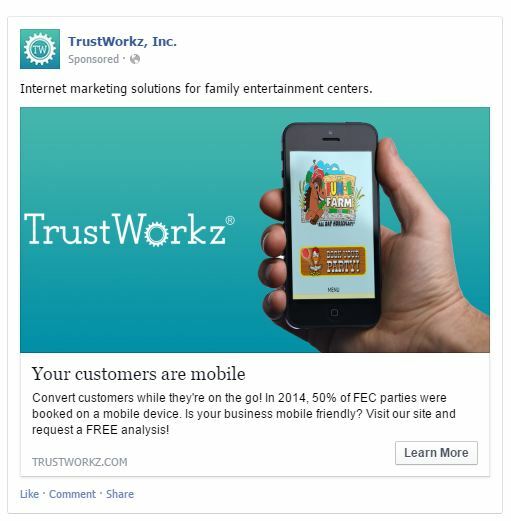 Contact TrustWorkz to learn more about reaching your customers through Facebook advertising.